If you want to make a small room appear larger, or simply give your walls an interesting textural look, consider painting the walls with two or more layers of paint. There are a few painting techniques for walls that make use of the layering effect to achieve an appearance of depth and dimension. These include color washing, rag rolling, and sponging. With these painting techniques, a glaze or wash is applied over a solid base coat of paint. While glazes are oil-based and tend to be more durable, washes are made by adding water to latex paint and tend to dry quickly. The more water added, the more transparent the wash will be. Before you begin any painting, first prepare the walls by wiping them down with a sponge and water mixed with a little soap or bleach. When the walls are dry, apply a coat of primer to ensure effective paint coverage. It is also a good idea to test the technique you are using on an inconspicuous area of the wall or on a poster board. This will help to determine the shade of color you want and get a hang of the technique. Color washing creates a subtle, cloud-like finish that works with many decorating styles. The depth it creates catches the eye and helps to hide any imperfections on the walls. First paint the walls with the base color and wait till the paint has dried. Next, apply a light coat of glaze in a complementary or contrasting color. Applying the glaze in a random criss-cross pattern or a swirling motion will prevent visible lines in the paint. Lastly, use a slightly damp rag to dab at the glaze, softening the lines even more. Rag rolling requires application with a rag to produce the effect of soft or crinkled fabric, like velvet, silk, or parchment. The light and dark textural “folds” give the appearance of depth. Paint on the base coat and allow it to dry. You can either employ the ragging on or ragging off method for this technique. For ragging on, scrunch up a damp rag in your hand, dip it into the glaze or wash and lightly blot onto the wall. To use the ragging off method, simply apply the glaze coat with a roller, then immediately dab the wall with a damp crumpled rag, removing some glaze to reveal the base coat. 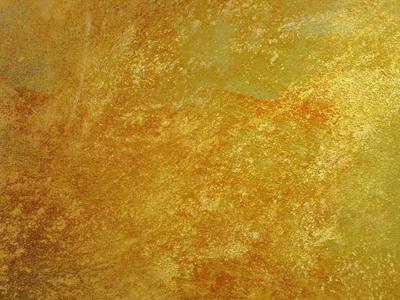 Sponge painting makes use of a natural sea sponge to create a mottled, porous look to the walls. It adds depth with its unique finish. More than two colors can be used for this technique, just make sure each layer has dried before applying the next. First paint the base color on the walls and allow the coat to dry. Next, dab on the glaze or wash with the sponge, taking care not to overload the sponge with paint, or a blotchy effect will result. Alternatively, apply a coat of glaze and remove some of the wet glaze with a sponge.